The newest book to shed light on historical adepts is a biography of an Algerian Sufi Sheikh, Abdelkader, whose final years were spent in Damascus where he became the close friend of Richard Francis Burton and his wife Isabel. John Kiser’s Commander of the Faithful: The Life and Times of Emir Abd el-Kader was acclaimed in the New York Times as “a dramatic story of quarreling tribes, of Sufi sects and brotherhoods, of treacherous Ottoman officials, rival French generals, secret negotiations, broken truces, terrible atrocities and new forms of insurgency and counterinsurgency warfare.” All those subjects are addressed in the first half of Kiser’s book which is set in Algeria, as was his award winning Monks of Tibhirine. Abdelkader rose to fame as the leader of Algerian tribes, but the second half of the military hero’s life was as an exile increasingly recognized for his noble character and spiritual studies. He became increasingly admired in French exile before being moved to Turkey and then Damascus. While in Damascus his involvement rescuing victims of anti-Christian riots brought him international acclaim including a gift from Abraham Lincoln. 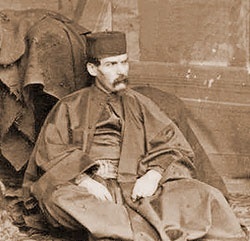 When Richard and Isabel Burton arrived at a British consular post in Damascus, they soon found and befriended the Emir. Another eccentric English traveler, Lady Jane Digby, was part of the Burton entourage during this period. My first published investigation of Madame Blavatsky was a 1986 booklet on possible Sufi connections between her teachings and those of Gurdjieff. The next focus of my investigations was the American artist Albert Rawson who promoted a variety of fringe Masonic groups in the US. Leslie Price of the Theosophical History Centre in London encouraged my research and published the resulting articles. By the time The Masters Revealed was published in 1994, I had learned of an international cast of characters involved in related Masonic activity in Egypt and the Near East. Richard Francis Burton emerged as a node in the social network of early TS supporters. Rawson and Burton have continued to be mentioned in new books about individuals they knew and whose lives were entangled with theirs. The combination of Masonic and Islamic themes and memes is found in both their works, and I recently learned of an 1892 article in which Rawson recounts decades of acquaintance with Burton. Of the figures profiled in chapters of The Masters Revealed, Burton is the one who has reappeared in various contexts relevant to the roots of The Church of Light. About a year after joining the CofL I was invited to participate in Donna Zuckerbrot’s documentary film which has seen on four Canadian cable networks from 2008 through the present. The subtitle of the documentary Madame Blavatsky: Spiritual Traveller was taken from my remarks, quoted at the end to the effect that HPB “created the model” of the spiritual traveller, whose search for truth was global in scope. After seeing it, I realized that she was just the first person to use a global search for spiritual truth from many sources as the basis of a new movement. But Burton is more deserving of accolades for creating the model that she exemplified, which later inspired such explorers as Alexandra David-Neel. He was the most celebrated British explorer of the mid-19th century, and first met Blavatsky in Cairo in 1853 as he was preparing for his great trip to Mecca. In 1878 he joined the British Theosophical Society, but recent research by Marc Demarest indicates that he had been introduced to occult studies in England in the 1840s as a member of the so-called Orphic Brotherhood led by Edward Bulwer-Lytton, Richard James Morrison (Zadkiel), and Philip Henry Stanhope. Albert Rawson, who introduced Burton to Blavatsky, claimed four extensive journeys to the Middle East, in one of which he became acquainted with John Varley II, a painter whose family was very prominent in British astrological and occult circles from the beginning of the 19th century. Varley and his wife Isabella, the aunt of William Butler Yeats, were members of the short lived Inner Group of the London TS lodge* and lifelong Theosophists. Varley traveled extensively as a landscape painter, best known for his depictions of Egypt. The header of this blog is detail from a Varley street scene of 1870s Cairo. James Peebles, who introduced Olcott and Blavatsky to leaders of Sinhalese Buddhism and the Arya Samaj, was another American globetrotter with connections in the Free Thought movement as well as Spiritualism. Peebles in Egypt will be the subject of a future blog post in 2011, but the next entry will focus on Hurrichund Chintamon who was involved with the Arya Samaj, Theosophical Society, and Hermetic Brotherhood of Luxor. Here is the link to Albert Rawson’s piece on Burton, “Personal Recollections of Sir Richard Francis Burton, KGMG, FRS, FRGS,” and it runs from pages 565-577, with the story of Burton’s meeting Blavatsky on 573-4. John Patrick Deveney demonstrated, in two articles published in Theosophical History, that Rawson is quite untrustworthy on chronology in his memoir of acquaintance with HPB. But this new find from Rawson conflicts with that previously known article about HPB, and fits what Deveney found to be plausible times when he might have been in the Middle East. Rawson not only claims to have introduced Burton to Blavatsky (in context which makes it clear that it occurred in 1853, conflicting with his 1851 date in the Blavatsky article) but quotes Burton thanking him for an introduction to Abdelkader. This entry was posted in Uncategorized and tagged Richard F. Burton. Bookmark the permalink.